DODOcase brings the familiar touch and feel of a good book to your favorite tablet. In my neverending quest to find the perfect iPad case, I’ve been giving the DODOcase a spin with my new iPad for the last several weeks. I’ve used Incase’s book jacket for the longest time on my iPad 2, and I wanted to change things up when I got the third-gen iPad. Based in a bookbindery and wood shop in sunny San Francisco, DODOcase has been an award-winning brand for iPad cases since 2010. Built with pinpoint precision for the newest iPad, the DODOcase lineup blends nostalgia and the cutting edge into a charming combination. My red DODOcase classic never fails to attract the curious eye while I’m out in public. If you’ve never seen a DODOcase before, then you may mistake it for a simple book at first glance. 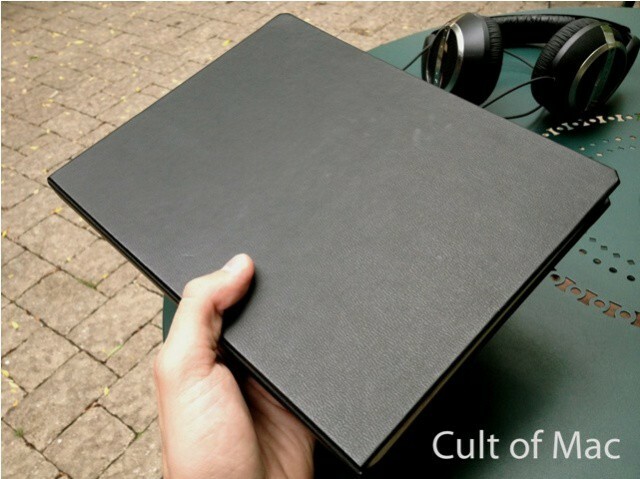 The case is constructed using traditional bookbinding techniques, and it gives the iPad a nice blend of protection and usability. It’s the attention to detail that really stands out here. 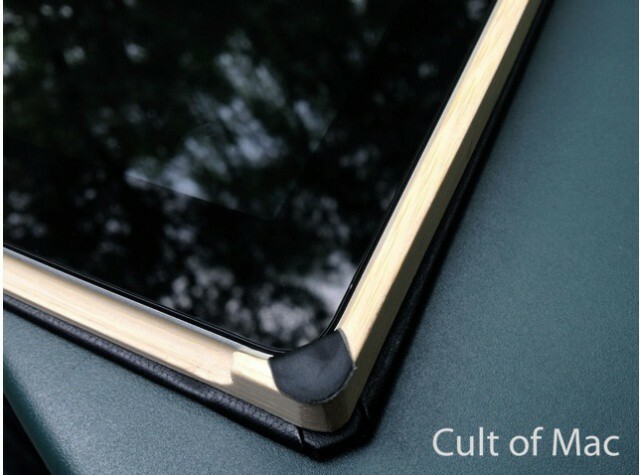 The inner tray is made of solid bamboo, and there are no actual clips or bands to keep the iPad in place. The wood has been so precisely designed that the iPad can be gently pushed into each of the 4 corners with little force. Once locked into place, I never feel like my iPad is going to fall out or come loose. DODOcase’s sturdy binding definitely helps ease my concerns. When the DODOcase is closed and elastic strap secured, it feels like the iPad becomes something more. You know you’re not carrying a hard-bound book, but you can pretend that you are. The bamboo tray and faux-leather binding keep the iPad safely concealed. The folding cover includes Smart Cover-like magnets to automatically put the iPad into wake and sleep mode. 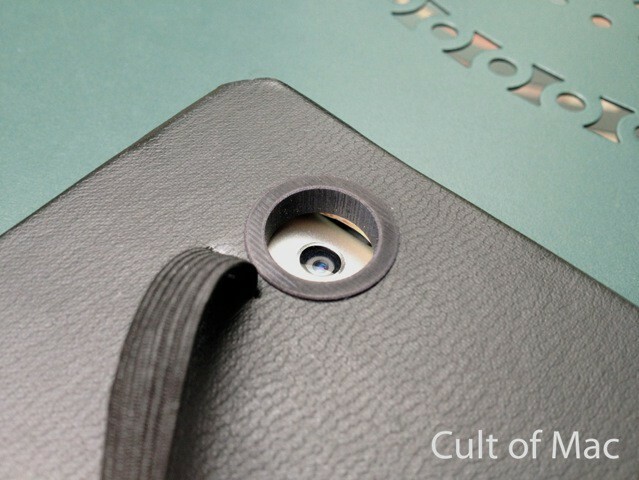 DODOcase etches a hole for the iPad’s rear-facing camera. 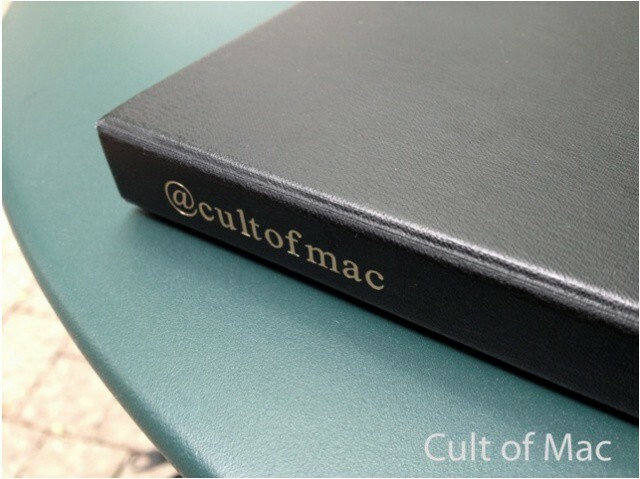 You can even get the case debossed with a personal touch. There isn’t much to dislike about the DODOcase, but I did notice that holding the wooden edges can become uncomfortable. I think whether you like or dislike this case depends largely on what you want from an iPad case in the first place. For more versatile, minimal needs, the DODOcase doesn’t fit the bill. That’s not to say it’s not good — just different. My previous iPad case allowed me to prop the iPad up in multiple positions for watching video and typing. The DODOcase’s front cover can be folded back to help prop the iPad up, but you don’t get much of an angle. Because the binding’s width is so small, folding the cover back hardly gives you any sort of viewing angle to type from. Writers should consider how an iPad case handles viewing angles before purchasing. If you like to lay in bed and watch Netflix or read, the DODOcase is probably not for you. The bookish design can start to feel heavy after a few minutes. Luckily, it’s easy to pop the iPad out of the tray. DODOcase makes a unique, sturdy iPad case that delivers in many ways. You get protection and full access to the actual iPad. The design is elegant and very well made. I wouldn’t recommend it as your main iPad case, but that doesn’t mean it’s not worth considering. DODOcase offers three styles at three different prices, and the new Spring Summer lineup includes some great color combinations. Each case is priced under $100, which isn’t half bad for something that’s hand-crafted with this level of detail. 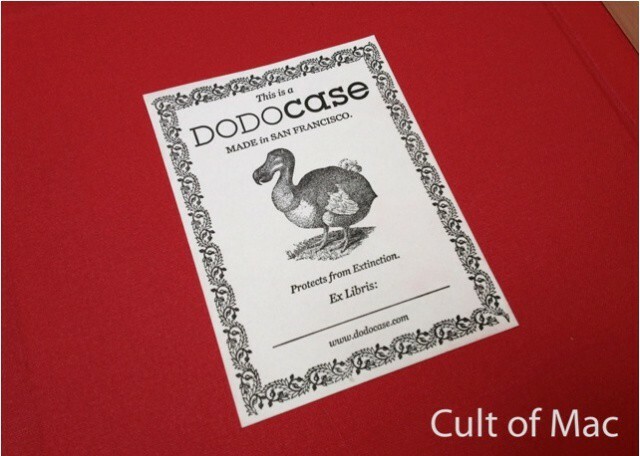 For more information, head on over to the DODOcase website.